The Upper Floridan aquifer in the lower parts of the Chattahoochee and Flint River Basins is relatively close to land surface resulting in a close connection between the groundwater system and streams and rivers. There is the potential for reductions in streamflow as a direct result of the large amount of groundwater withdrawals for agricultural irrigation and to a lesser amount for public supplies. This problem is exacerbated during drought conditions, when streamflows are already much lower than normal and irrigation rates are high to maintain viable crops. Aquatic wildlife are adversely affected as water levels in rivers decline and in smaller streams that may dry up completely. For this study, USGS evaluated the groundwater budget for the lower ACF using a MODFLOW-2005, a finite-difference groundwater flow model, and characterized the spatial and temporal relation between surface water and groundwater. Baseflows estimated with the groundwater model were used in the linked surface-water flow model to provide better estimates of surface-water flows that are affected by groundwater withdrawals. The Upper Floridan aquifer is close to land surface and in some areas is in direct contact with streams in the lower ACF Basin. Groundwater pumping in this area can result in lower streamflow that adversely affects aquatic biota in streams and rivers. The period 2008-2012 was selected for simulation of groundwater conditions because of the availability of monthly irrigation estimates which is the largest stress on the groundwater system in the study area. This period also had a wide range of climatic conditions ranging from drought to above normal rainfall. Recharge input was provided by the linked surface-water flow model with most occurring during the winter months. Model input included spatially and temporally variable specified recharge and pumping, and the model was calibrated to measured groundwater levels and base flows which were measured using hydrograph separation. The model simulated a net loss in groundwater storage over the period of about 3.6 percent, probably resulting from the extreme dry conditions at the beginning of the period. Although the results do not address long-term changes in groundwater storage, the model could provide insight for planning to optimize water and land use. 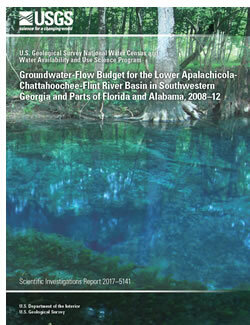 Groundwater levels in the Upper Floridan aquifer and streamflows in the ACF have experienced long-term declines. Model results show a net loss of groundwater in storage during 2008-2012 of 3.6 percent, primarily resulting from climate conditions during that period. Recharge is greatest in winter whereas groundwater pumping peaks in summer, so groundwater storage is critical to maintaining water supplies.